There's something about watching deranged, remarkably intelligent screen criminals that appeals to me. John Travolta blew me away as a crazed villain in Broken Arrow, and Dennis Hopper made an eerie, repulsive presence in Silence of the Lambs. Now Michael Keaton (who I always swore looks a little crazy) plays possibly the most interesting bad guy so far this year - a bloke with an IQ of 150 and a craving to kill. Pete McCabe (Keaton) is a ruthless killer locked away inside a maximum-security prison. He "gets the chance to kill again" without leaving the prison, if he refuses to transfer his bone marrow to a compatible young boy (Joseph Cross) dying of Leukemia. He eventually agrees to the operation, purely for a chance to escape. When the surgery does not succeed as the boy's cop father Frank Connor (Andy Garcia) would like to believe, he refuses to give up on his son and is in hot pursuit of McCabe. Although there are certain to be many skeptics, Michael Keaton worked wonders for me as the ferocious, unyielding McCabe. Keaton himself seems so out of place in his role that it ends up beneficial to the film - we can't predict his next move, because it seems so improvised that he doesn't know himself. Director Martin Barbet Schroeder (Single White Female) gives a sense of solidarity to the film. All scenes are cleverly interlaced, so that when the final moment occurs, it feels as if we have experienced a memorable thrill ride - even though we find ourselves in a similar position as we were to start with. This is perhaps the main reason why Desperate Measures is better than most action films - it achieves some clever footwork - but ironically, fails to improve on some of the most common action film flaws. To start with, Andy Gracia's performance is problematic. The actor himself is quite tuned in to the task (and, as I mentioned before, is very realistic), but the plot's bumbling setup means that his character will inevitably be caught up in a careless cat-and-mouse chase. It's careless because we rarely get to see Garcia and Keaton on the screen together; on most occasions McCabe hatches his schemes from a distance which minimizes the tension, and ultimately, interest. Perhaps Schroeder's intention was to create suspense so that when the characters did meet towards the end, it would be a dynamic conclusion - but this never properly works. Arguably the most important scene, the final confrontation on top of a nowhere-to-run-from bridge, completes skips whatever chance it had to make an upbeat semi-finale. The strange thing this, the very last scene - where McCabe chats to a hospital guard - caps off on an almost perfect, wonderfully twisted note. This is indeed a bizarre mixture: textbook action sequences with startlingly realistic performances. But that's it for Desperate Measures. It's sharp and well executed in what it does, but this unfortunately is not much - and is often very unconvincing in its science, and reason. We are not only expected to believe that McCabe is the only person available with a compatible bone marrow, but also his escape using a combination of different chemicals that looks like something from MacGyver. What's next - give the man a paper clip so he can destroy the hospital? I wouldn't be surprised. 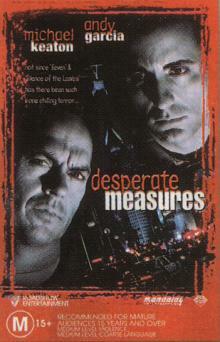 Desperate Measures, although sometimes frustrating to watch, is ultimately a pleasing flick. Michael Keaton's performance is alone worth the price of admission, and he has successfully added himself to my favourite "deranged criminals" list. This is a film about a battle, not between good and evil, but between two sociopaths. One, a convicted killer (Keaton) is playing a vindictive killing game, the second, more horrifying conscienceless killer (Garcia) is a cop who will stand by and allow the killing of anyone on the off chance that his own child might be saved. Such a selfish, immoral attitude disgusts me and leaves us all at risk when an individual puts their own emotional attachments above and beyond their responsibilities and the safe-being of others in the community. As humans we live in groups as an act of trust, this arrogant family first and f*ck the rest is at the heart of community-breakdown, something even worse than the so-called criminal element.